Slow pace of PVE combat. The Settler’s Online is a well designed game by Blue Byte for a free browser game. The building graphics are very crisp and polished. But the lack of player vs player interaction and slow pace of the game basically turns the game into a glorified chat box in the long run. The Settlers franchise just celebrated its 20 year anniversary. In a world where the free-to-play model is taking over, it is no surprise to find that the latest Settlers installment follows suit. The Settlers Online (also once called “Castle Empire” in America) plays right from your browser with nothing to download. It is a city building game revolving heavily around resource management in a MMO setting. You start with a mere cabin in the woods. Barbarian camps control outlying areas. You only have a handful of disparaged citizens. But with over seventy-five unique buildings to construct, you can expand control over your island and build a bustling empire. Buildings have five levels of upgrades, each with a new correlating graphic, improving its value or production rate. The base of the building goes up quickly; but like similar browser based games, upgrading to the higher levels takes any where from an hour to as long as a week with a real money option to instantly complete it. There are varying production chains involving farming, hunting, mining various ores, forging weaponry for your military units, buff creation, and more. The game is persistent so you don’t have to remain logged in. Over time your buildings net you resources which you can use to trade with other players over the Auction House system or use yourself to fuel expansion, upgrades, or your military. After you build a barracks you can use your resources to equip your citizens with weaponry, sending them off in combat to either victory or death. Your starting units will be recruits, bowmen, and cavalry with more potent forms of similar archetypes further levels ahead. Before you go into battle you can check to see what types of units the enemy has and then attack with the most cost effective unit mix to best defeat it which takes a bit of strategy. To attack you must first build a general hired from a tavern. Generals can be named and store a max of 200 units. Veterans are special generals that will hold up to 250. 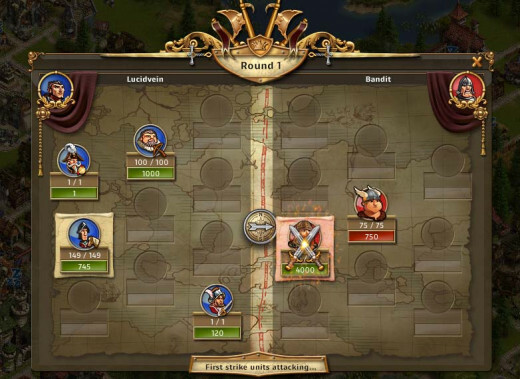 Your army is visually represented in a battle tent on the map where attack, retreat, and move orders can be assigned. When battle is complete and you are victorious, the enemy camp is cleared, and you gain experience and loot. Once the boss camp is cleared you secure the territory for your empire. If you lose a battle your general he will have to recover for a few hours before you can resume using him. A visual enactment of the battle can be viewed from your mailbox upon completion of a battle event. 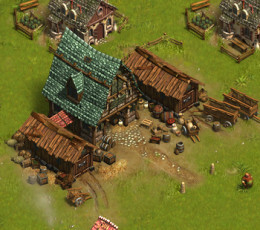 Once your empire is sprawling and your island is clear of bandits, you will continuously be upgrading the buildings you have constructed to power your economy. To continue to level and unlock higher tier structures and rewards, you must explore beyond your starting island. You can start adventures on your own once you are level 26 by sending your explorer out to find one (of over 30 varying maps). You can always be invited along to a multi-person adventure earlier though. Individual camps will no longer reward you, you will have to complete the adventure in the time provided. Once completed your army returns to your island, and a pile of fortune awaits you in your mailbox. The main longevity you will find in Settlers Online is the friends you make along the way. At level 17 anyone can create a guild or you could find another guild to join prior and build up some early relationships. 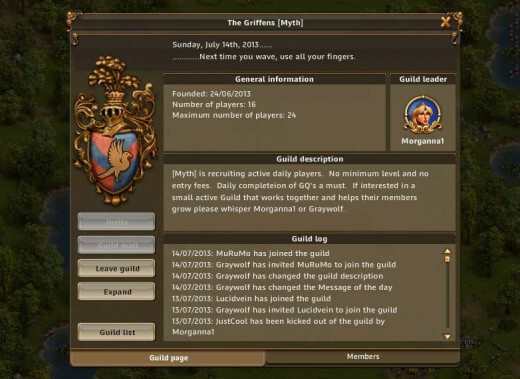 Guilds have their own chat window and member interface. You can visit any guild member’s empire or in game friend and buff their production buildings. Buffs on another person’s buildings last 50% longer than if you buffed them yourself. That encourages buff trading. Another advantage to being in a guild is help is always a chat message away. Guild members will generally lend a hand with free resources, help in adventures, and be able to offer advice on such things like building placement strategies and point you to combat guides. Guilds also have their own currency “guild coins.” Guild coins are awarded by having a large percentage of your guild complete the revolving guild quests. These coins are a good way to get access to otherwise real money boons such as a longer builder queue. 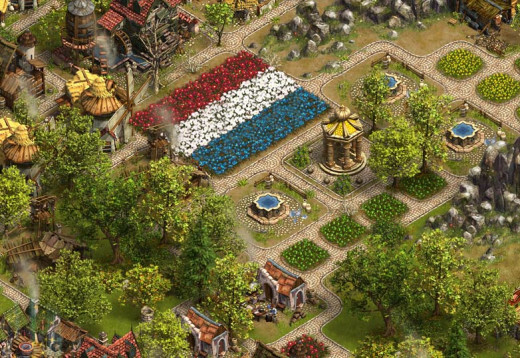 In The Settlers Online, you will likely find an event is running during a holiday. Your island might be covered in snow during Christmas, hidden eggs might be scattered across islands to find during Easter, and various buildings could be unlockable during an event that can only be obtained later with real money. Other world events are sometimes recognized too. During the world cup, you were able to earn soccer balls that let you obtain special buffs or your choosing of a countries flag laid out in flowers. It’s a nice touch that keeps it fresh during the lulls. 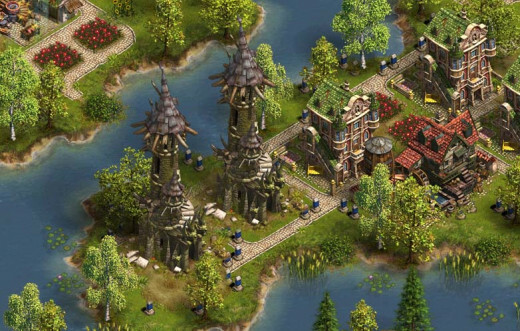 The Settlers Online is an evolving game that allows for some interesting city building gameplay. Some welcome additions are the new skill trees for geologists. generals, and explorers, the ability to move buildings, and raid content are welcome changes. But the development team seems to push updates at a snail’s pace. It’s a well designed game by Blue Byte for a free browser game. The building graphics are very crisp and polished. But the lack of player vs player interaction and slow pace of the game basically turns the game into a glorified chat box in the long run. If you are looking for a city building game with an active community though and you don’t mind the slow pace, The Settlers Online is a great choice.